Chamas do Brazil offers a uniquely authentic Brazilian steakhouse experience in an upscale setting. 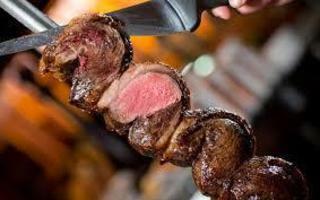 Gauchos skewer tender filets of beef, mouth-watering legs of lamb, succulent pork loin, juicy sausage and 11 other cuts of meat, and cook them to perfection on a custom-made grill that was flown in from Brazil. As the gauchos cross the restaurant floor, bossa nova music plays overhead while at the bar diners select from approximately 150 unique wine offerings from the U.S., South America and beyond. Bartenders mix cold caipirinhas, Brazil’s signature drink made with cachaça, an intensely sweet style of rum. Art work painted by a local Brazilian artist, hangs near the expansive salad bar which offers more than 50 freshly prepared vegetables and delectable traditional side dishes. Decadent traditional Brazilian offerings found on the dessert menu include papaya cream (papaya with ice cream), passion fruit mousse, and pudim – cream caramel (similar to flan).